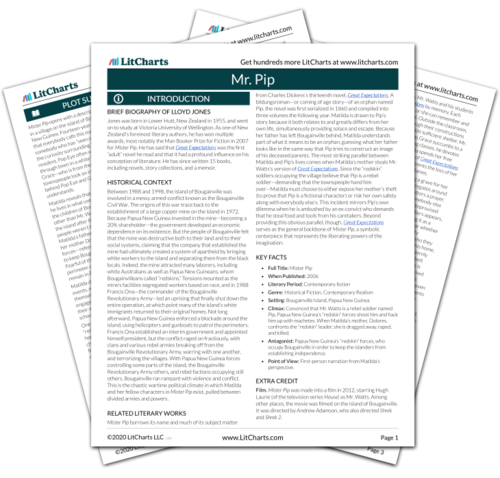 Instant downloads of all 946 LitChart PDFs (including Mr. Pip). 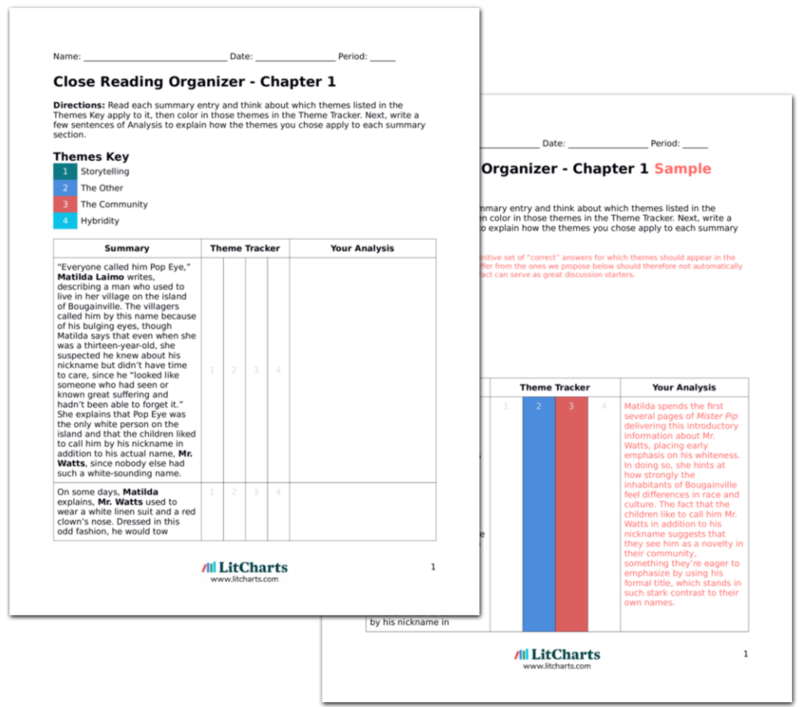 LitCharts assigns a color and icon to each theme in Mr. Pip, which you can use to track the themes throughout the work. Matilda’s idea regarding betrayal implicitly gives rise to the notion that Mr. Watts and her mother are on two distinctly different sides of a problem. Unfortunately, Matilda—who is so adept in borrowing bits and pieces from different worldviews—is caught between her teacher and her mother. This dilemma is reminiscent of the structures of the Bougainville Civil War: if Dolores and Mr. Watts represent the two warring military forces, Matilda represents the villages who wish to occupy a neutral gray area in the conflict. Lannamann, Taylor. "Mr. Pip Chapter 14." LitCharts. LitCharts LLC, 6 Oct 2017. Web. 24 Apr 2019. Lannamann, Taylor. "Mr. Pip Chapter 14." LitCharts LLC, October 6, 2017. Retrieved April 24, 2019. https://www.litcharts.com/lit/mr-pip/chapter-14.